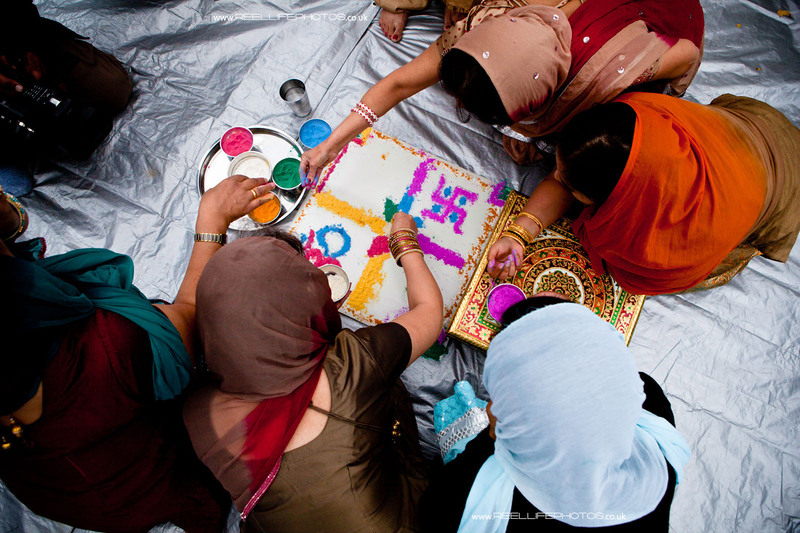 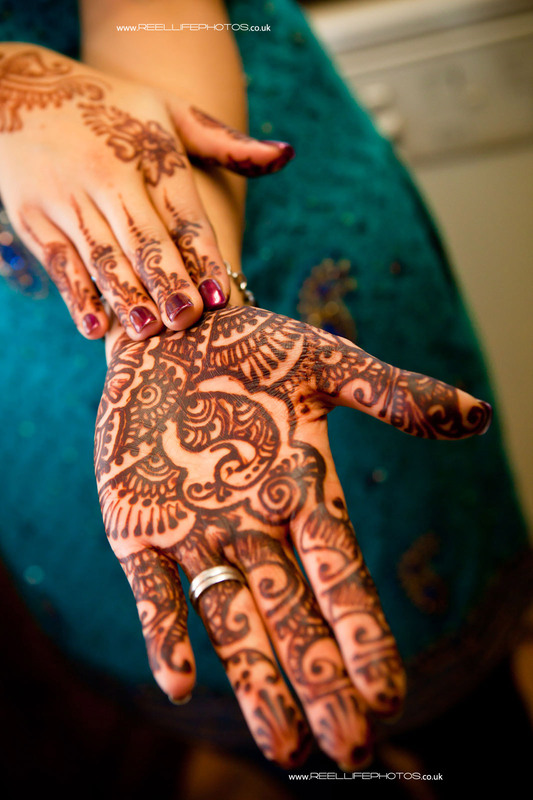 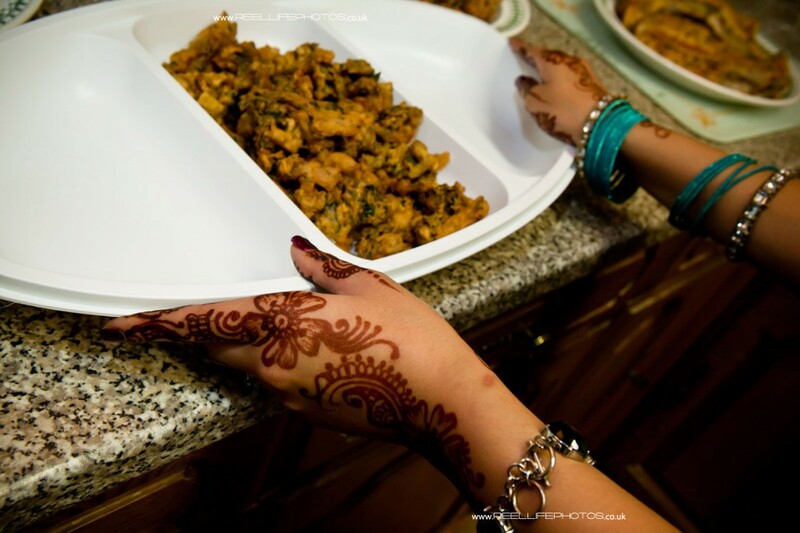 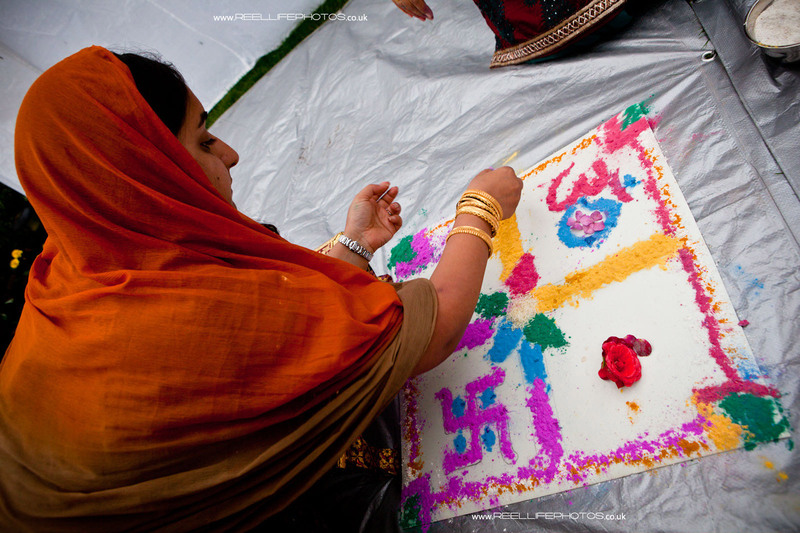 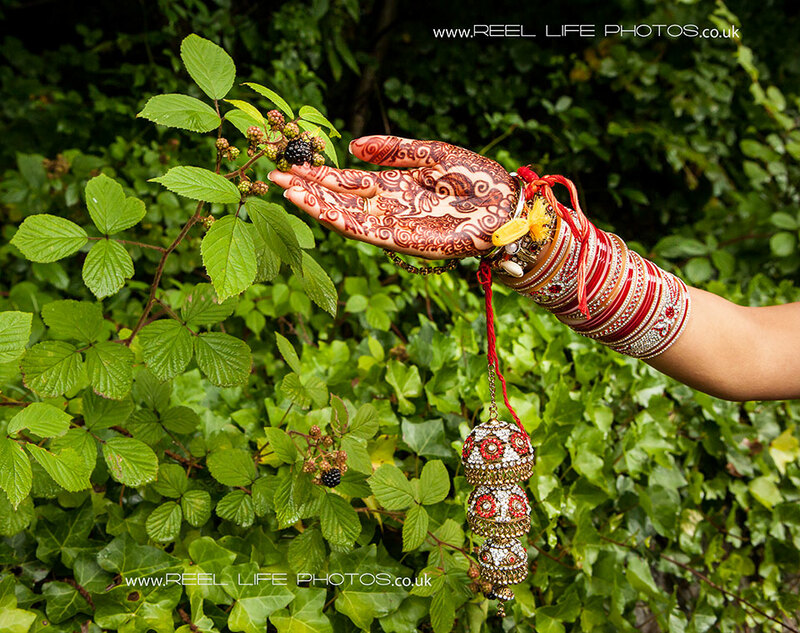 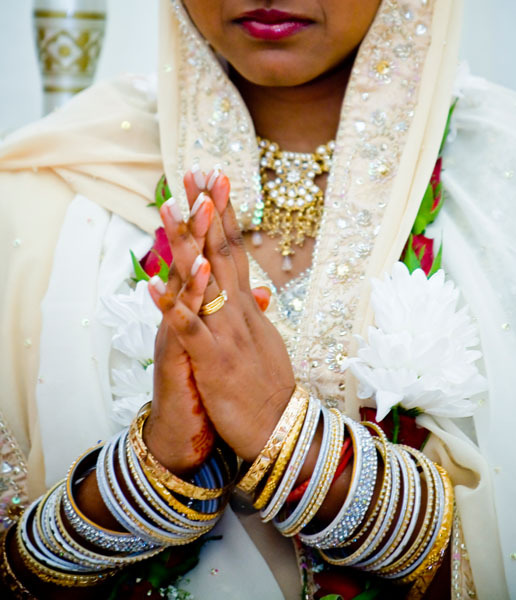 Hindu bride’s henna on her hands. 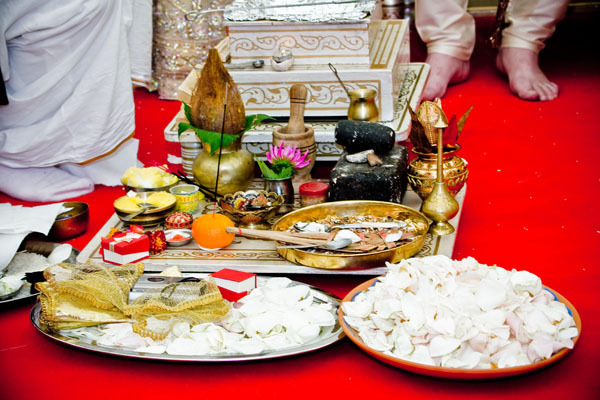 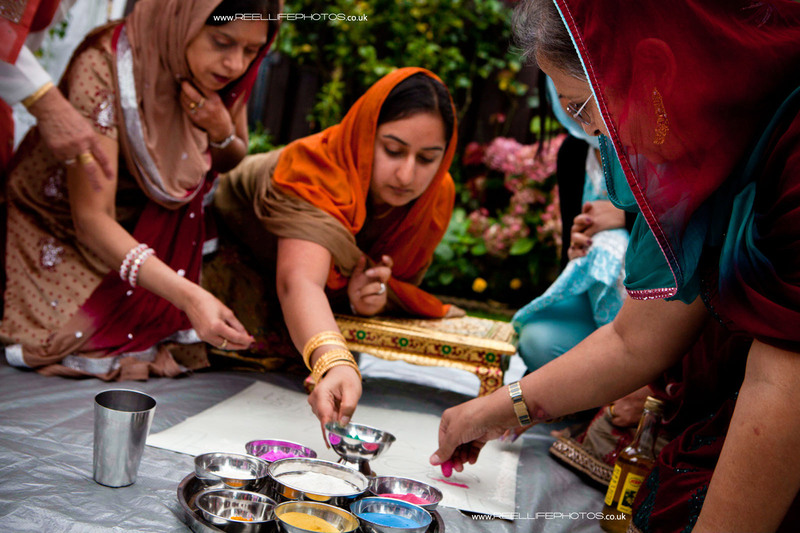 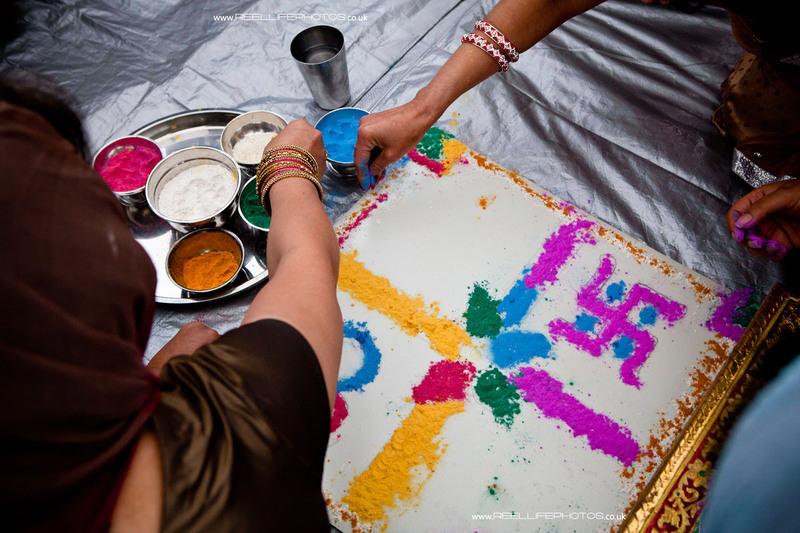 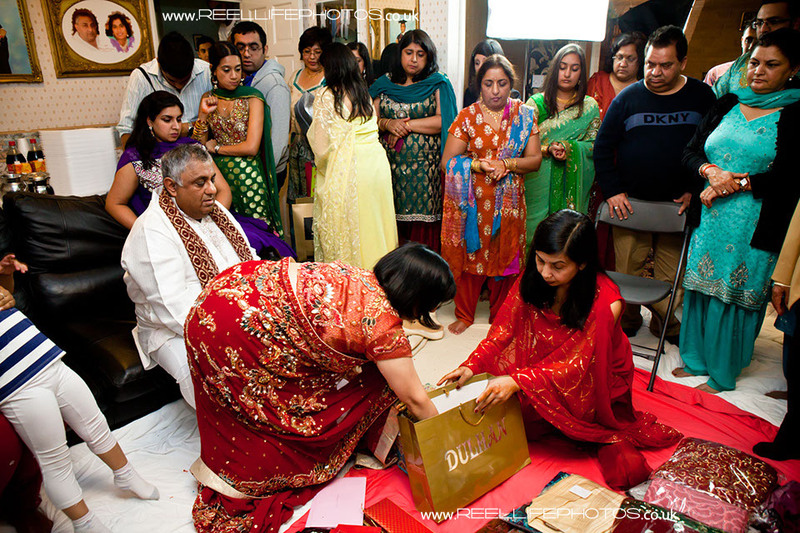 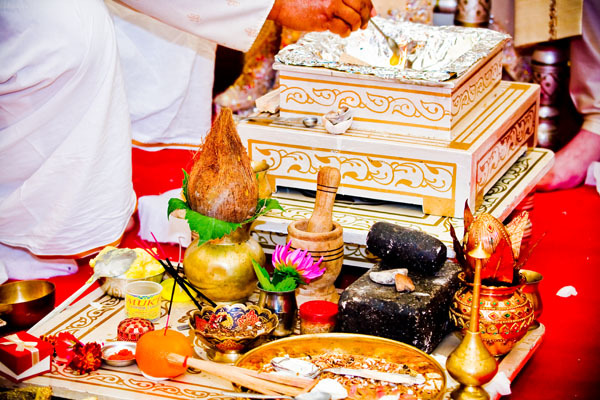 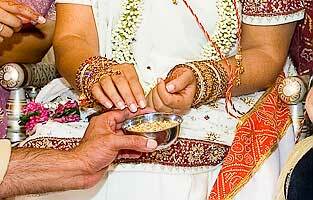 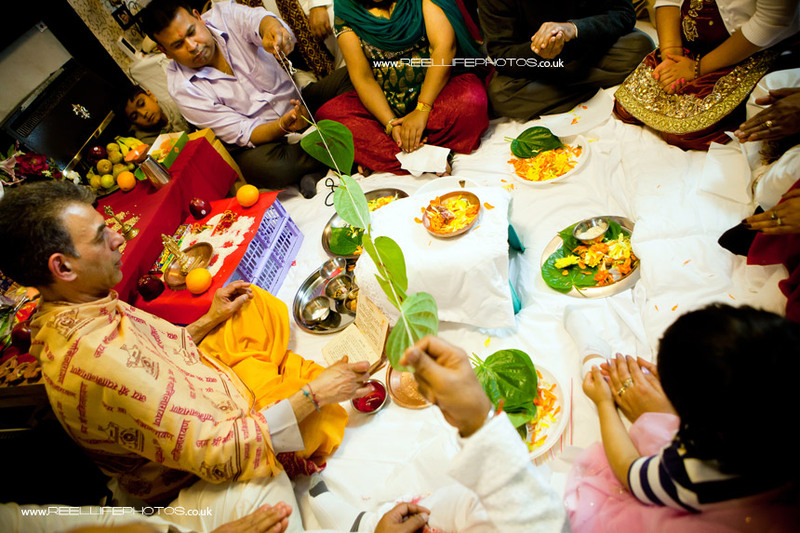 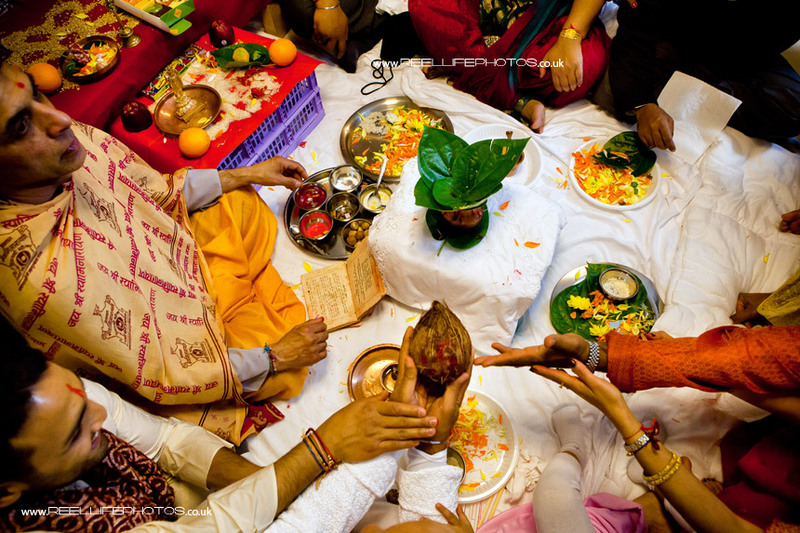 Hindu Sainth wedding ceremony, traditional Hindu religious ritual performed by priest. 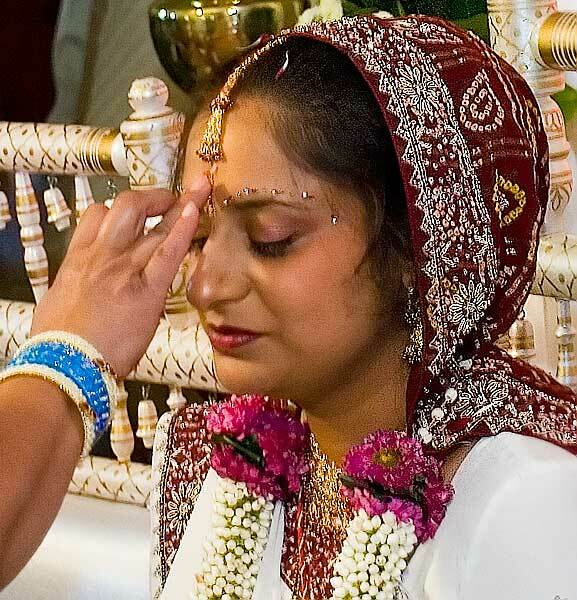 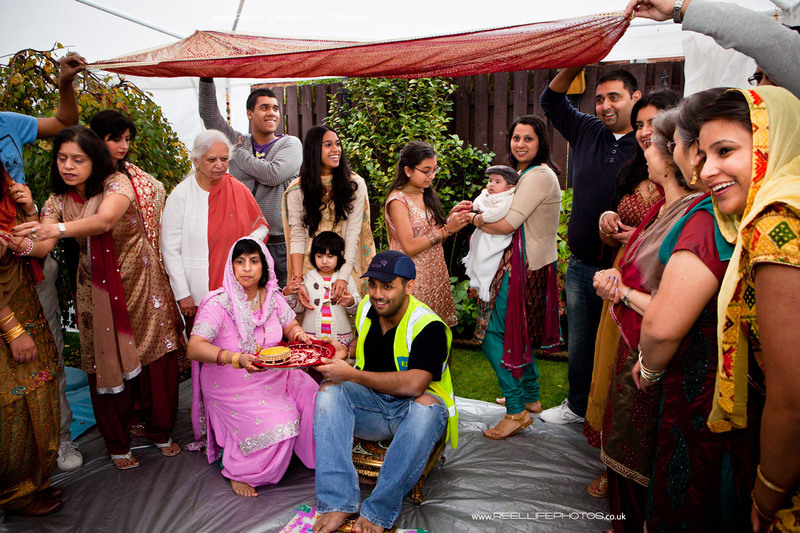 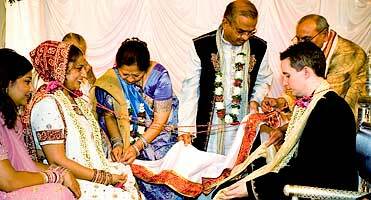 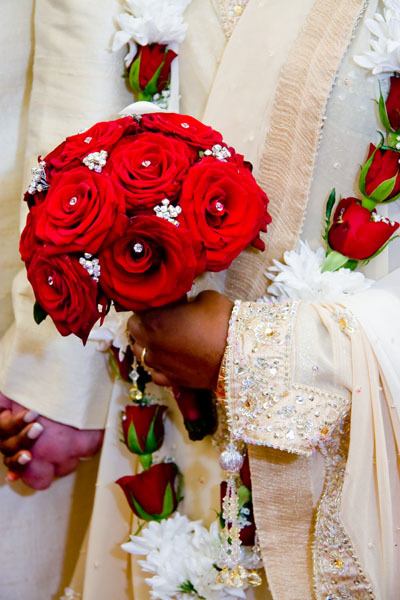 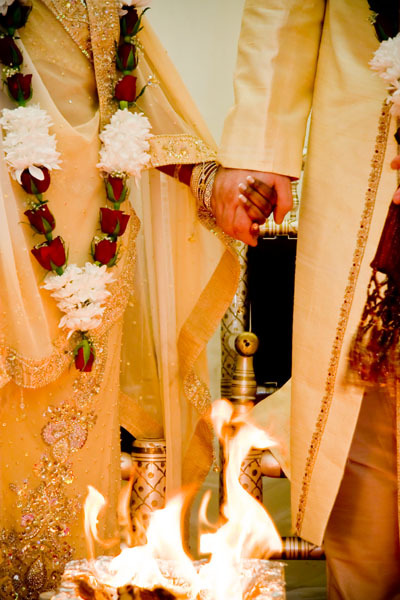 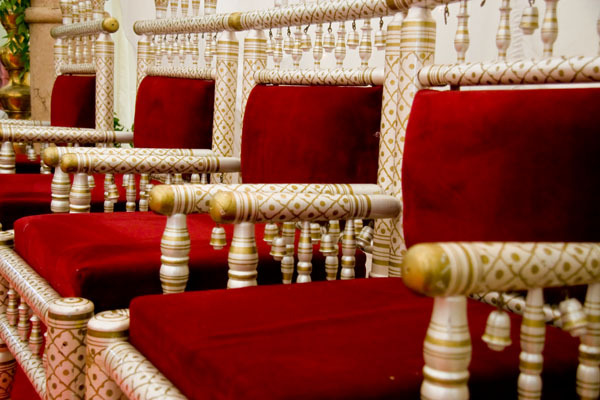 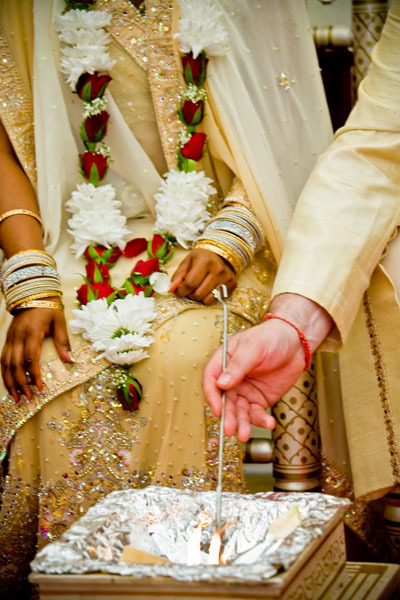 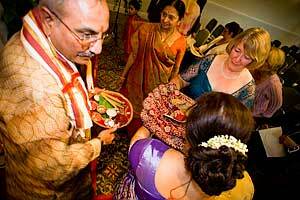 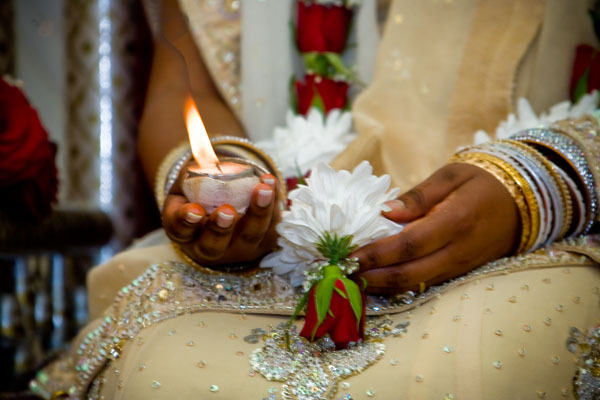 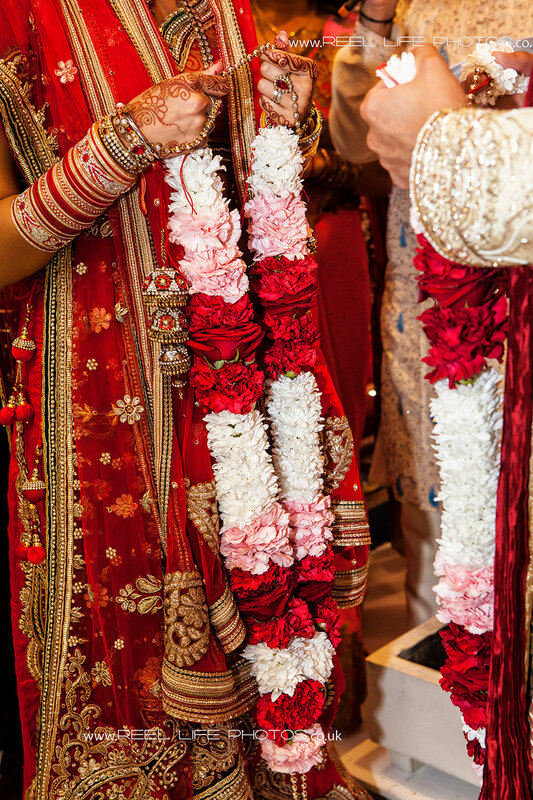 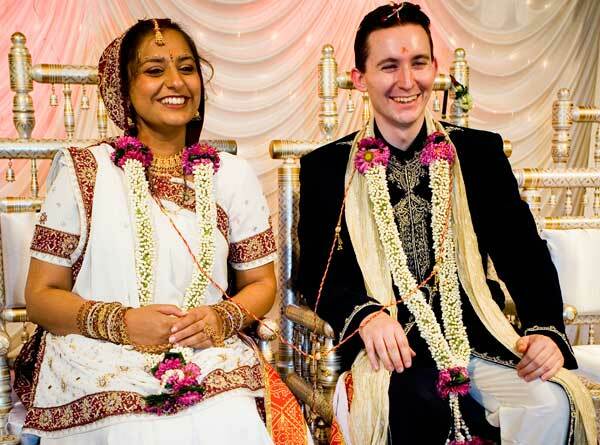 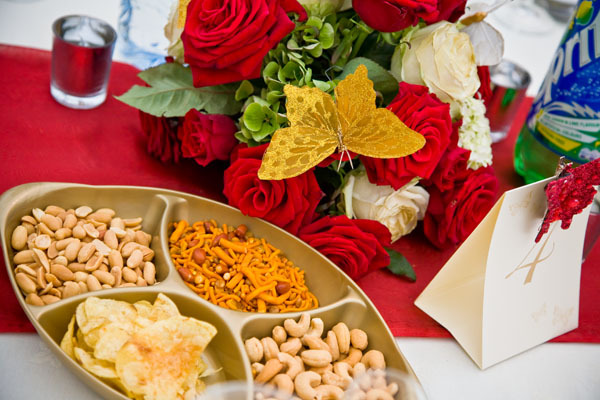 Vishal’s Hindu wedding comprises of several individual ceremonies. 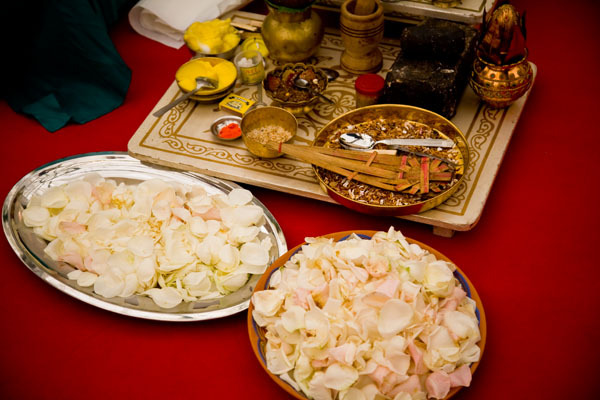 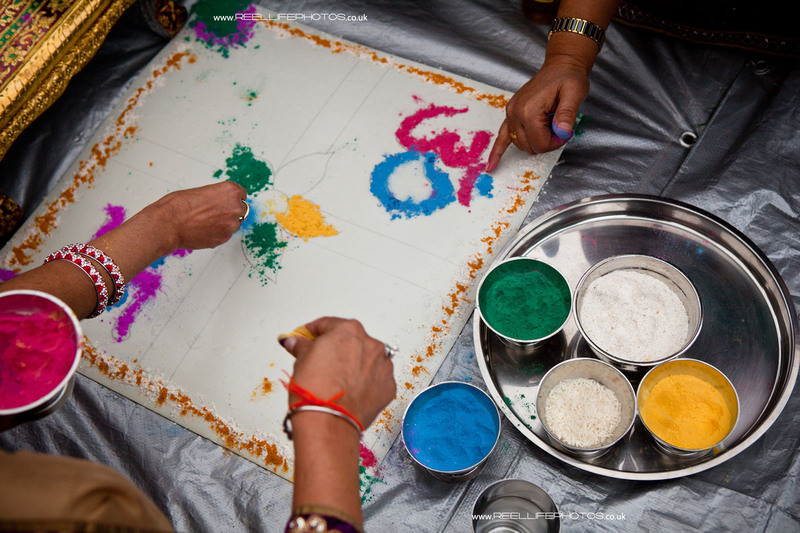 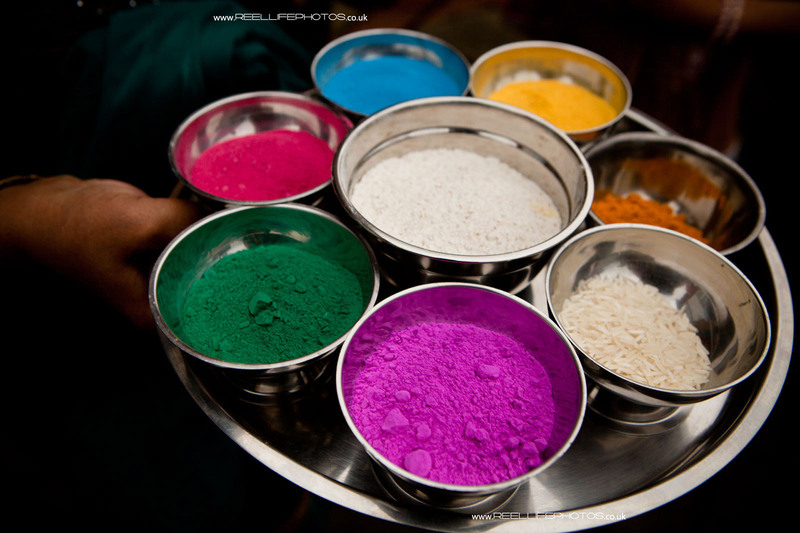 After the Mayan (Miyaan) comes the Sangeet – bit of fun for all the wedding guests – then the Sainth, a religious ceremony with oils, natural plants and seeds. 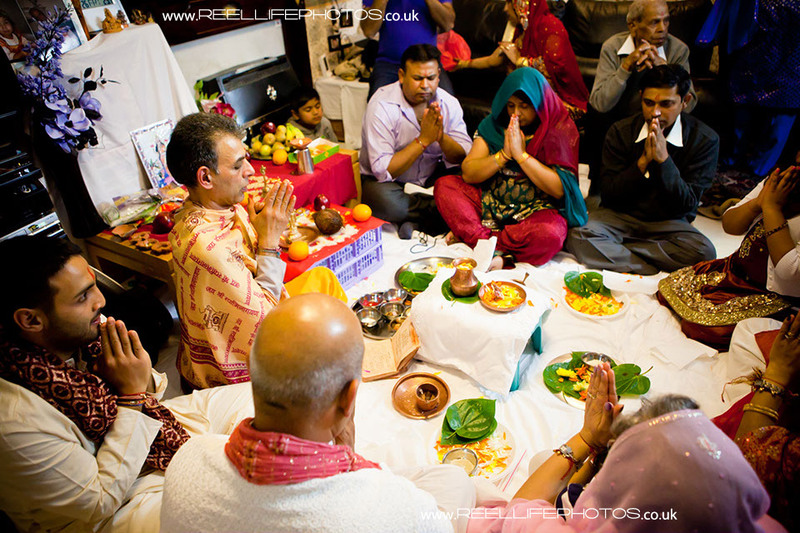 The priest conducts the ceremony – which could be on the floor of the temple, or as here in the family home. 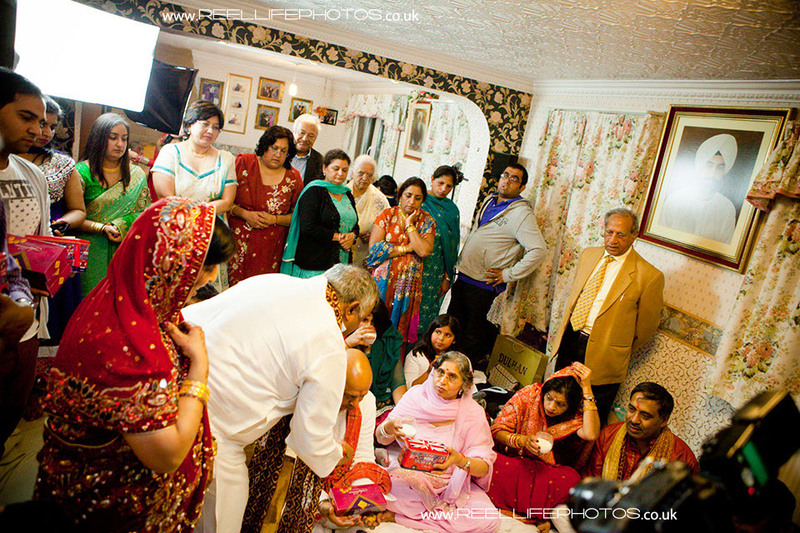 The key family members sits round in a circle in front of the priest, and participate throughout. 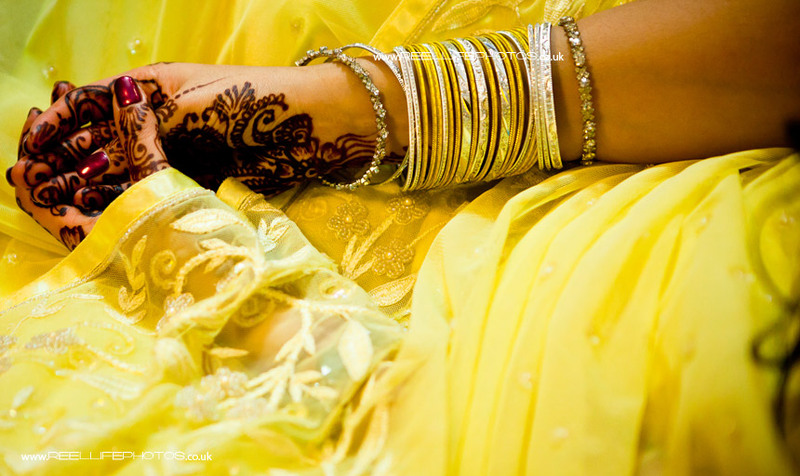 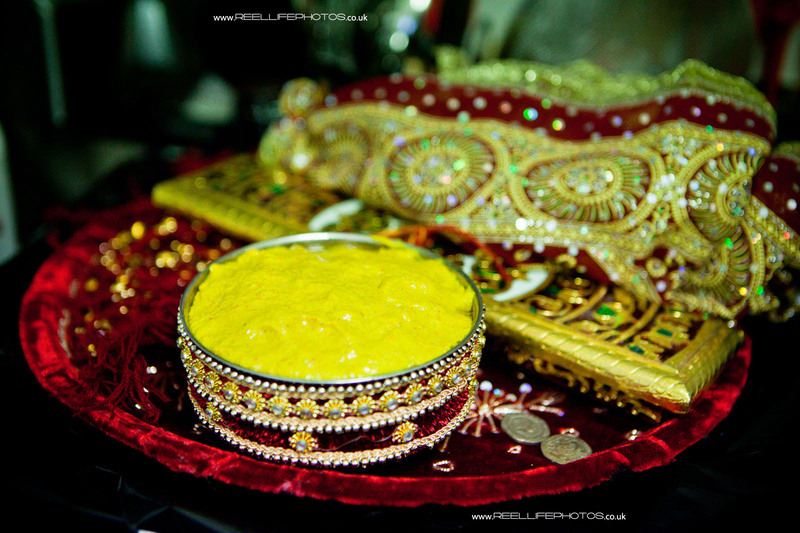 What a beautiful buttercup yellow sari with mehndi - so just couldn't resist starting with this glorious splash of colour! 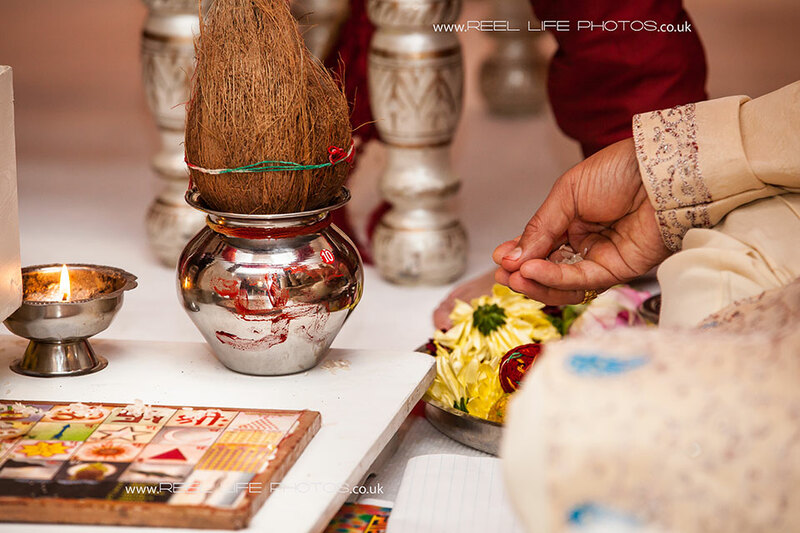 The coconut is passed to one of the family by the Hindu priest. 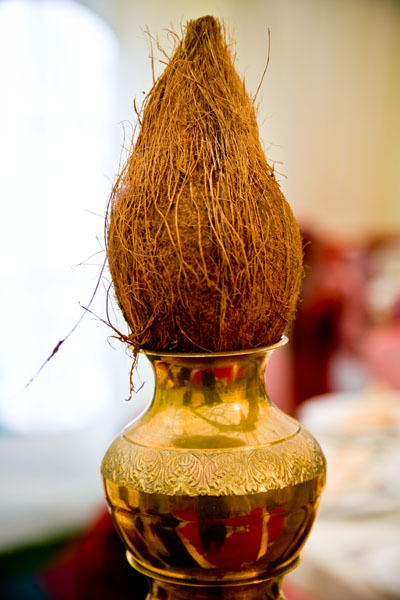 The marks on the coconut maybe perceived as representing the three-eyed Lord Shiva so it brings good luck. 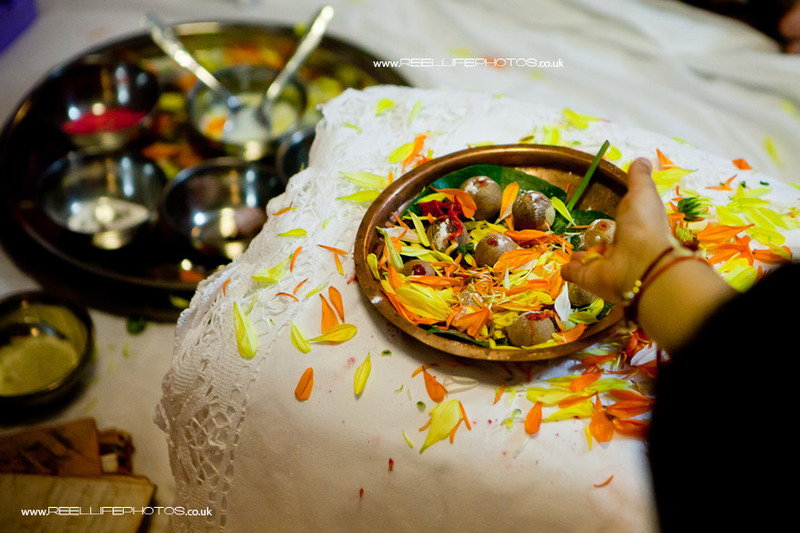 Sometimes it is smashed to reveal its soft white centre, representing the human brain, as it looks a bit like a human head, thus the ego is squashed and presented to the Lord. 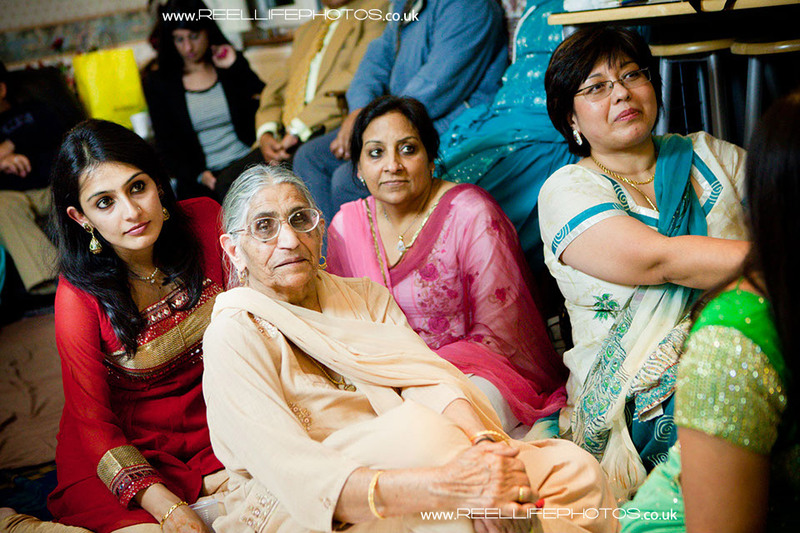 Here is more of the evening’s story in pictures…..
Young and old sit down on the floor together. 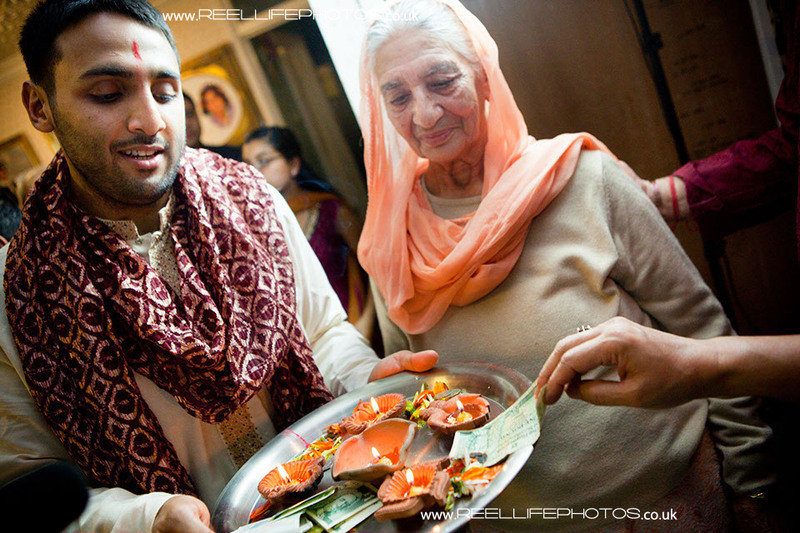 Money is given here too. 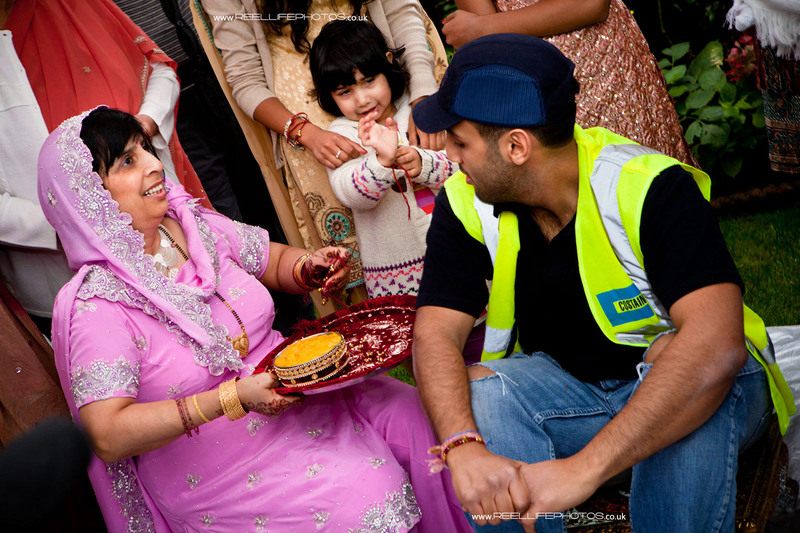 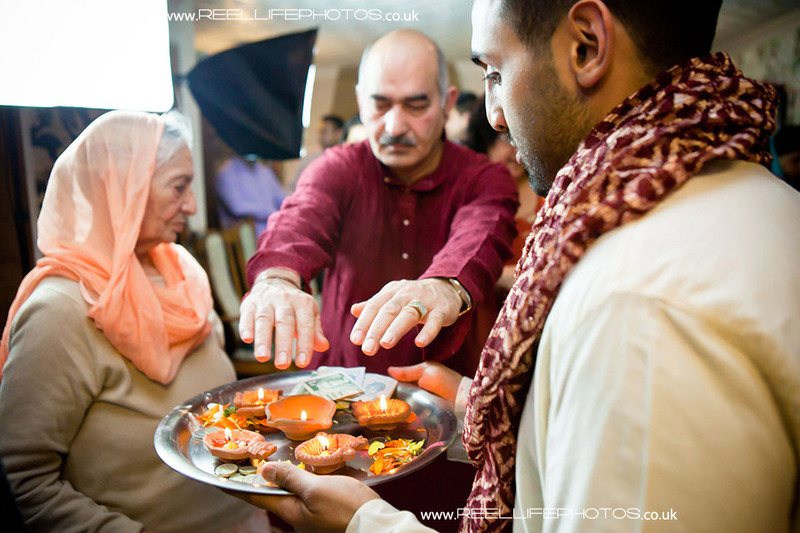 Just a moment in time, as the candles are passed round and hands add money to the tray. 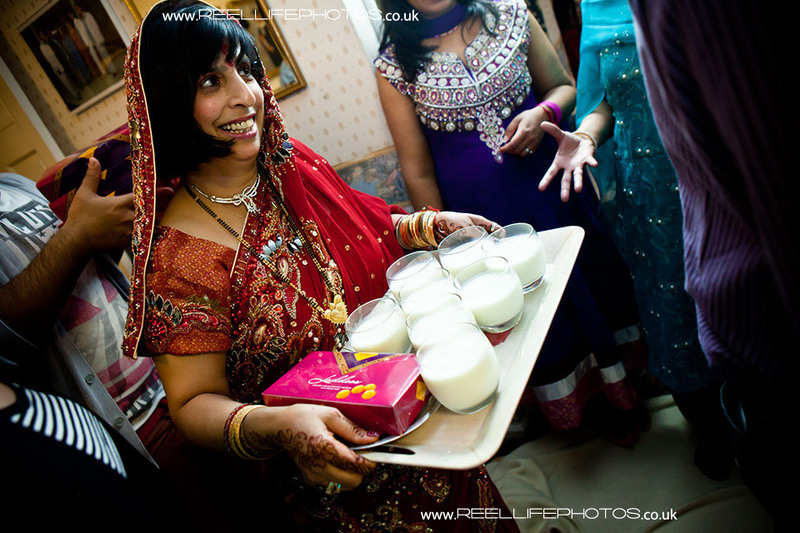 Happy smiles again as the milk arrives. 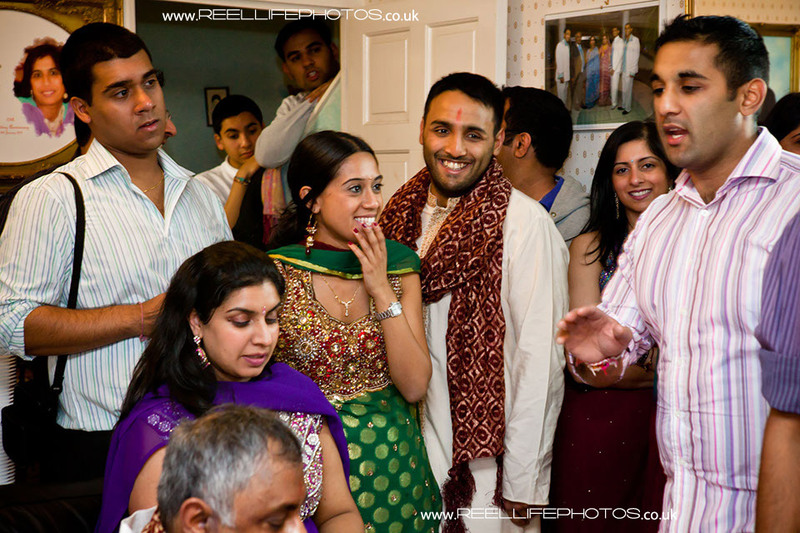 Groom Vishal and his brother Dinesh causing a stir! 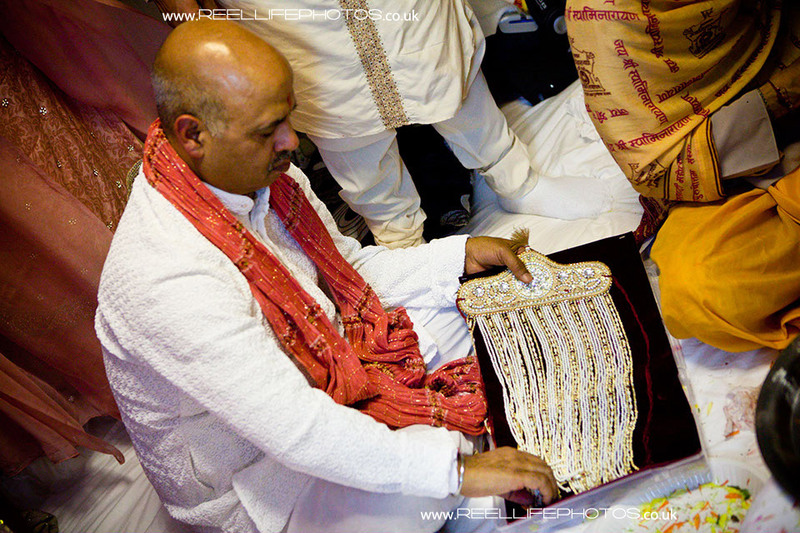 Visit www.LeedsWeddingPhotographers.com for more info or to contact Elaine, the wedding photographer here. 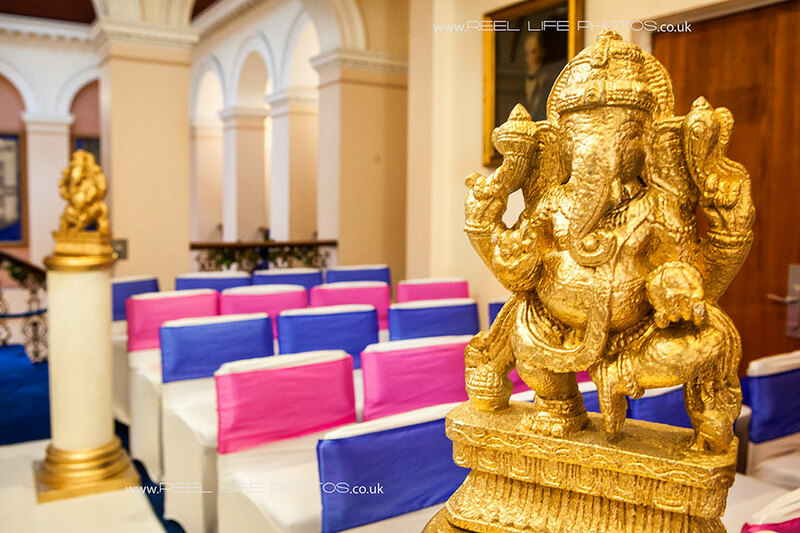 This is the second wedding we have covered for the same family of boys in the South Yorkshire town of Barnsley, so now we feel part of their extended family: many hours work – but all great fun. 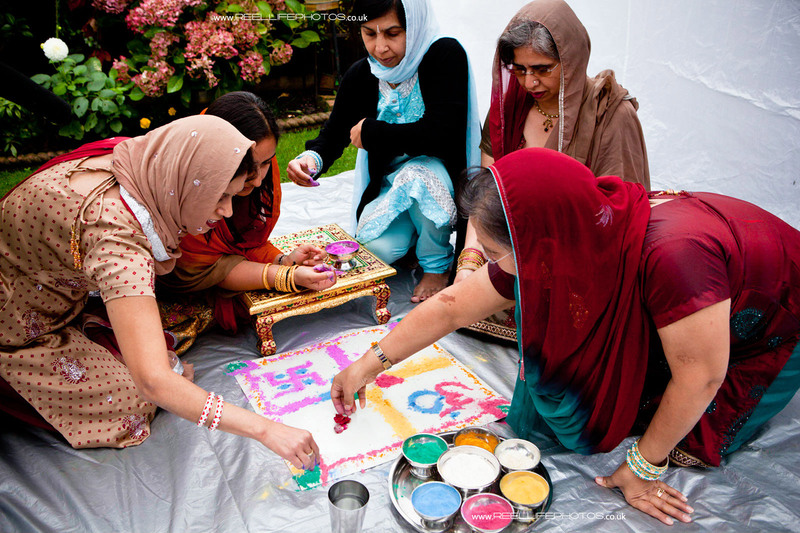 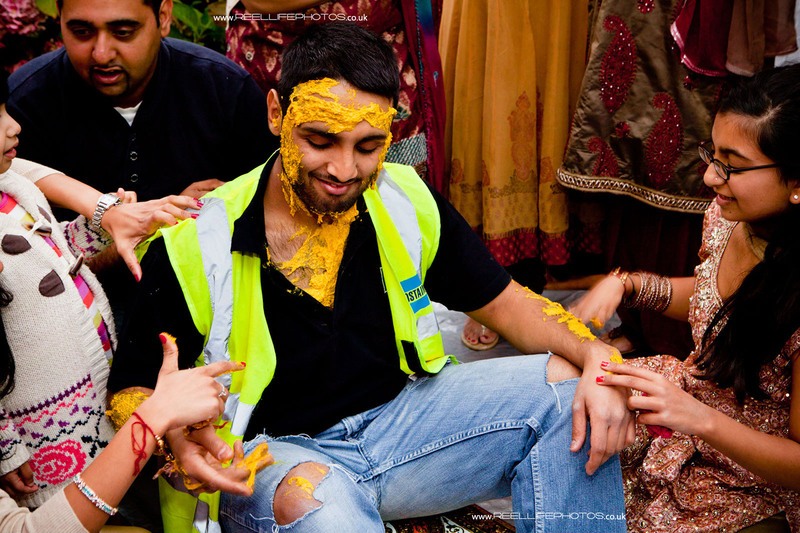 Its a bit like a Stag-Do where the bridegroom is smothered in a turmeric paste and coloured powders, but in front of all his family and close friends in the garden of their family home. 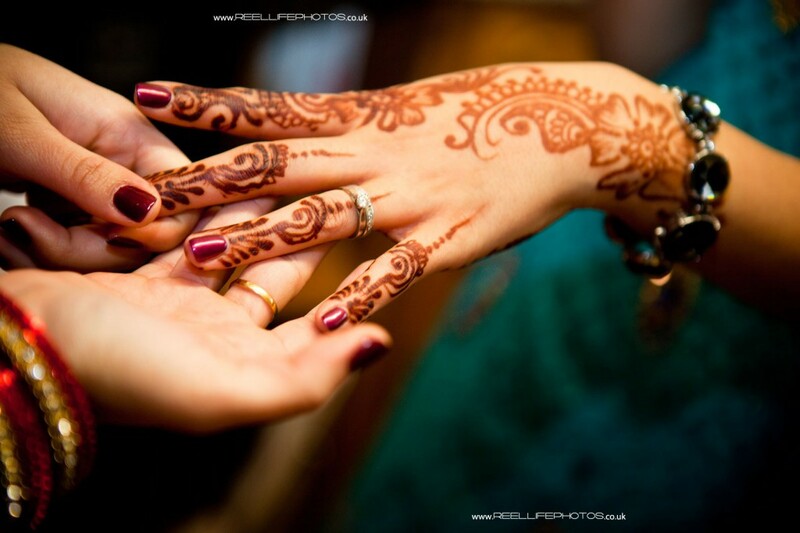 hands fit for a magazine.. 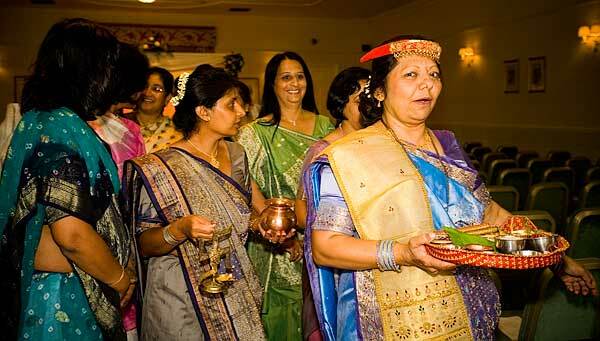 The women start to get ready for the ceremony. 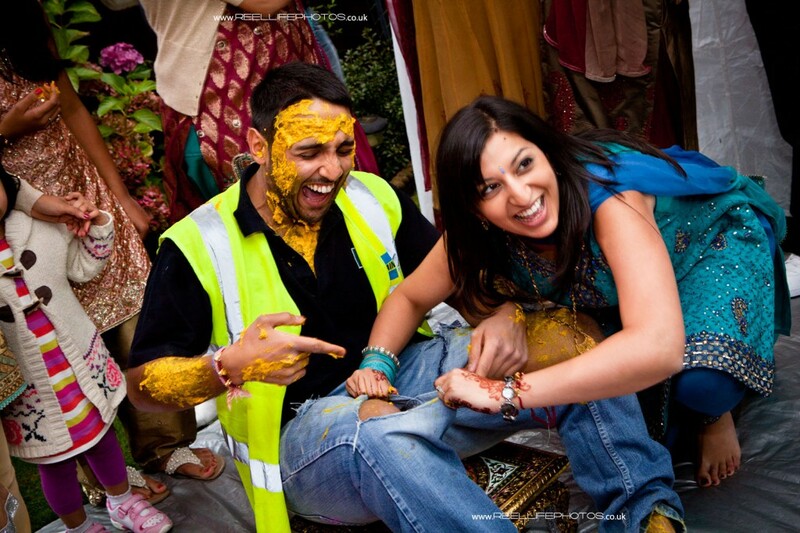 Oh how they are loving it! 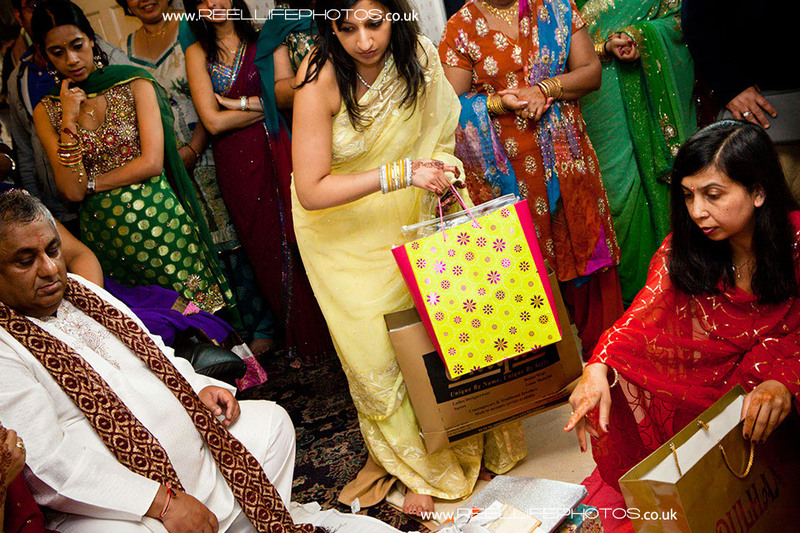 The groom's torment hots up!" 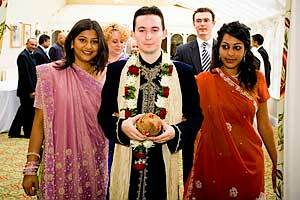 How carefully they avoid his eyes and mouth. 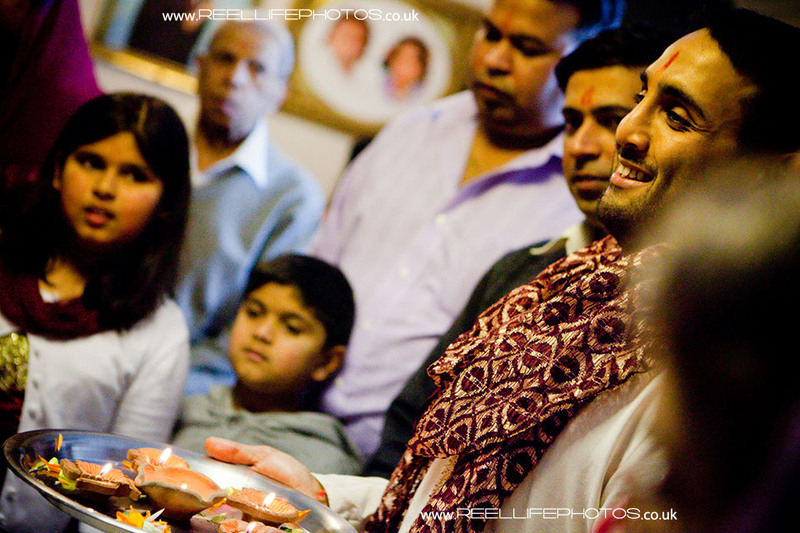 Seems they all love him! 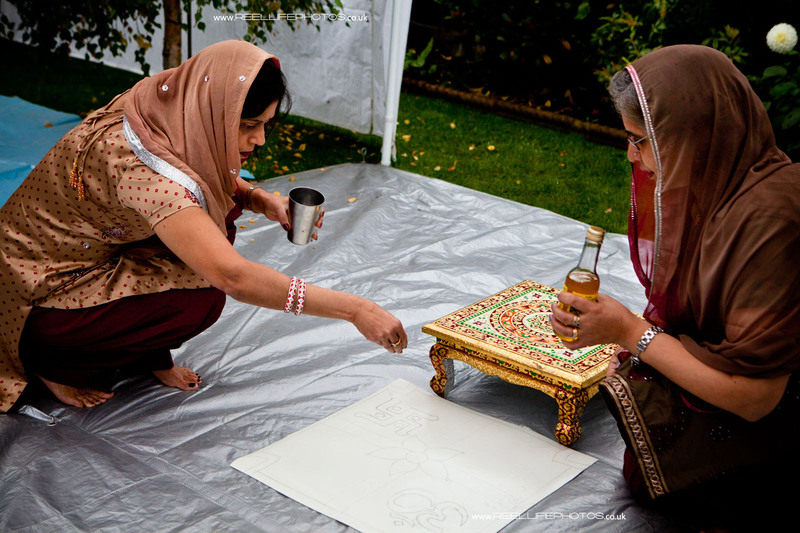 Ooh this is getting a bit daring! 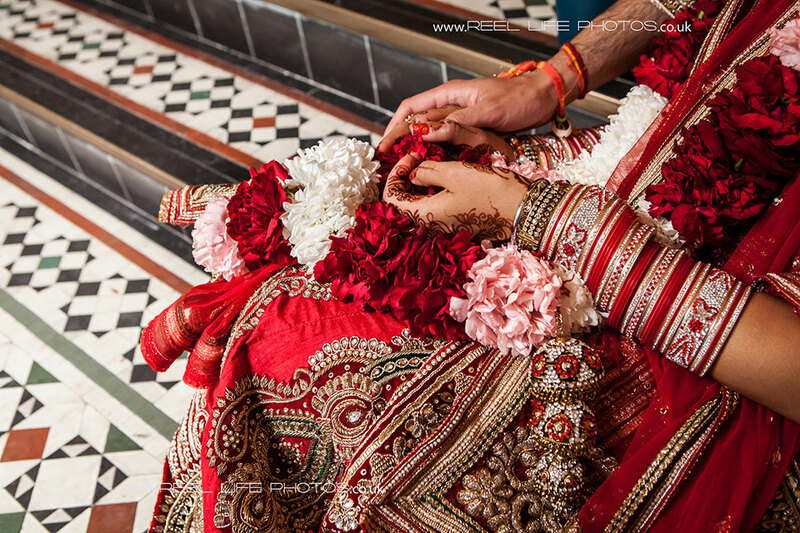 I actually won first prize in an international wedding photography competition – $1,000, from the Professional Wedding Photographers’ Network and was awarded the top wedding photographer excellence award for pictures from this couple’s Hindu wedding this year 2012, just days after the wedding had taken place! 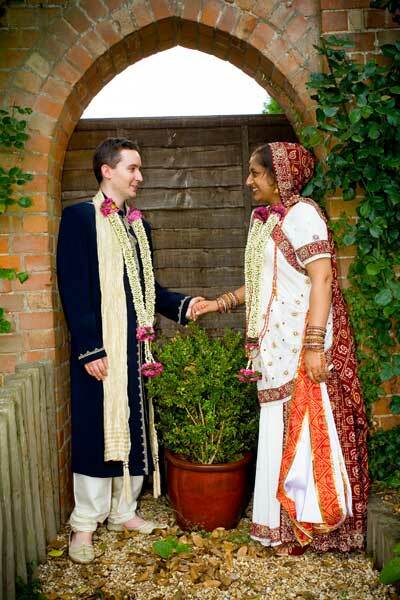 I was once asked where all our best wedding photos were! 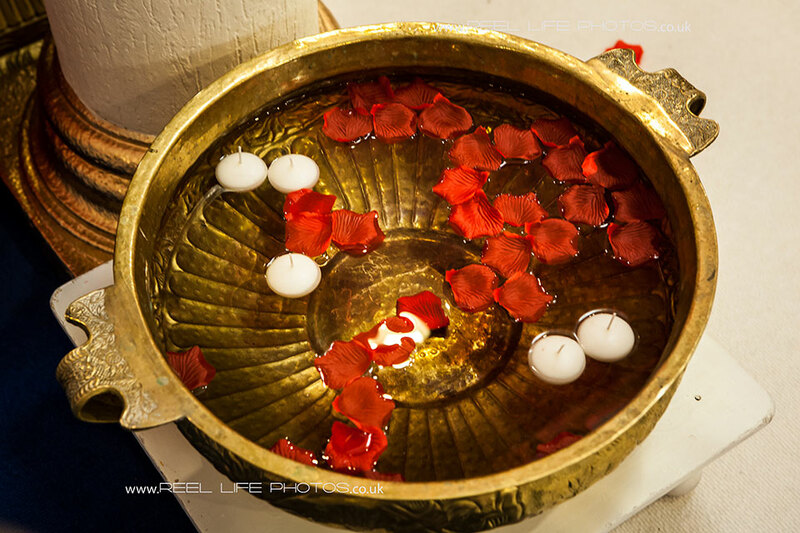 Well, they are all there in our online galleries – all the little gems – but buried between the vast expanse of variety that makes for human life. 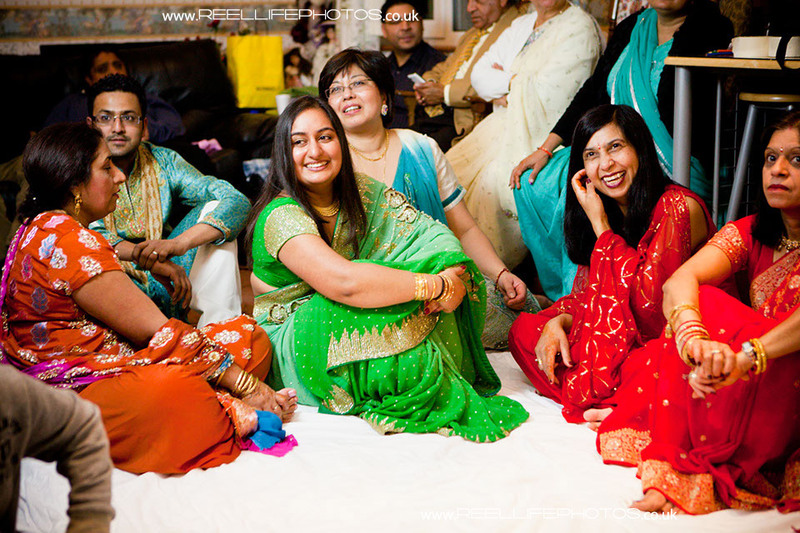 Having documented so many facets of this, I thought it was time to revisit a few faces, and to give myself a short breathing space, away from the constant converting of images and preparation of chosen photos for printing, for other (albeit very important) people. 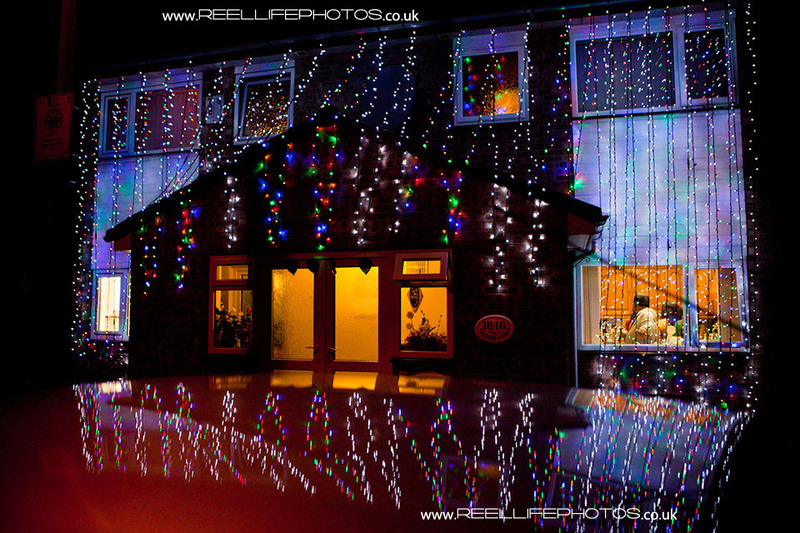 Its been over 3 years since I designed the visual aspect of our existing website, so have been busy the past two evenings, putting together a selection of some of my favourite recent images, which will soon be making their appearance on the home page – thanks to Mark and his web-techies in Huddersfield at www.e-connected.com . 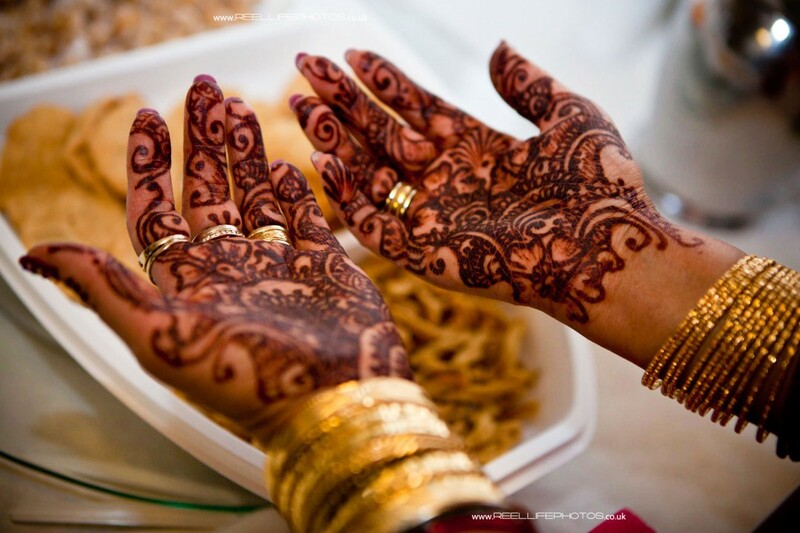 Hope you all like the new-look, when it goes live. 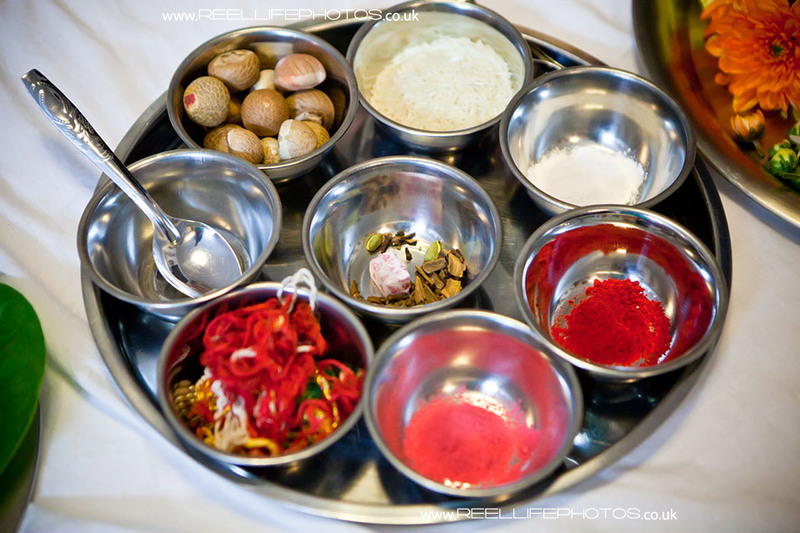 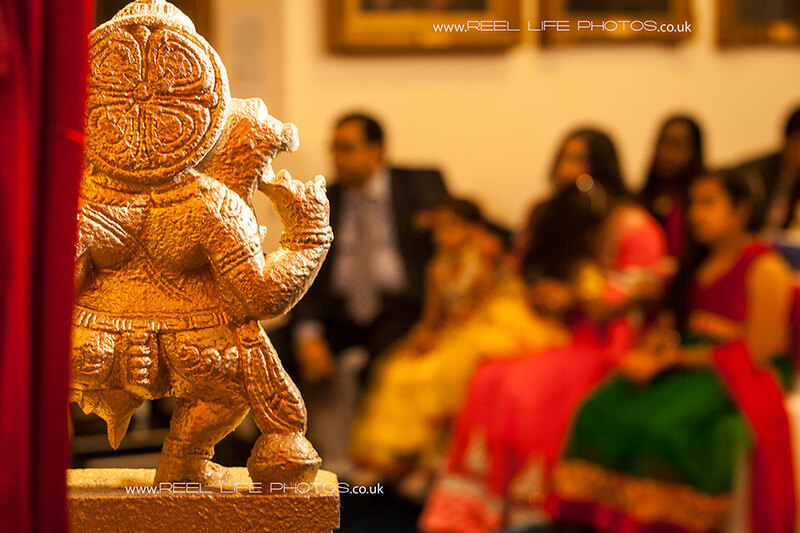 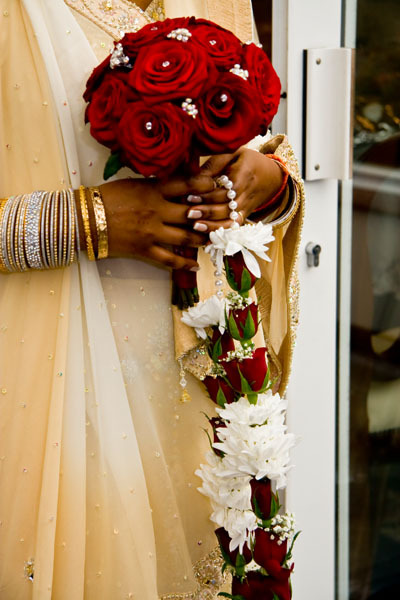 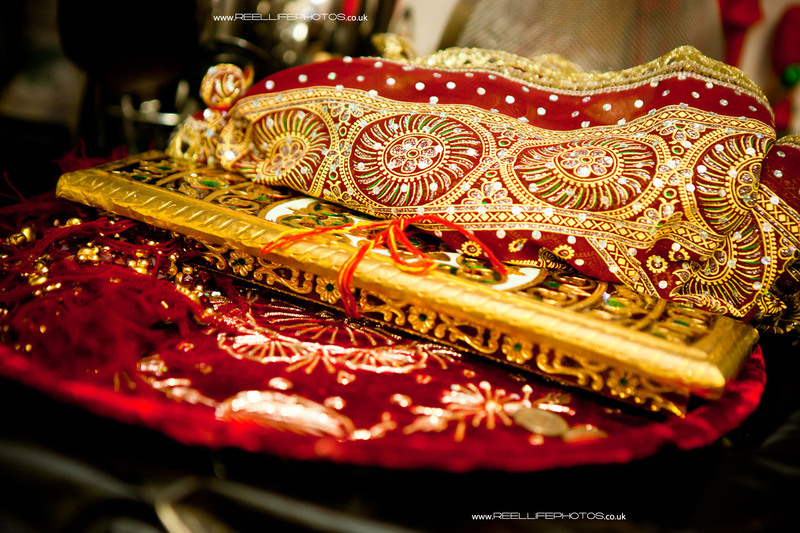 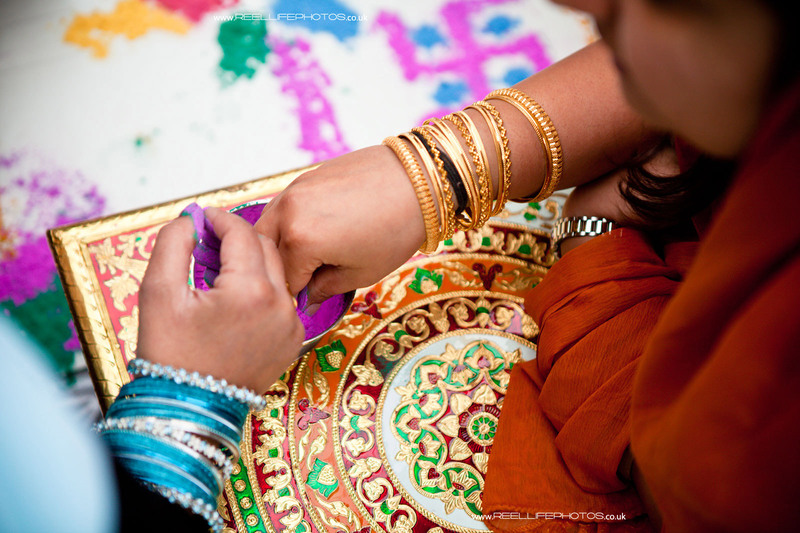 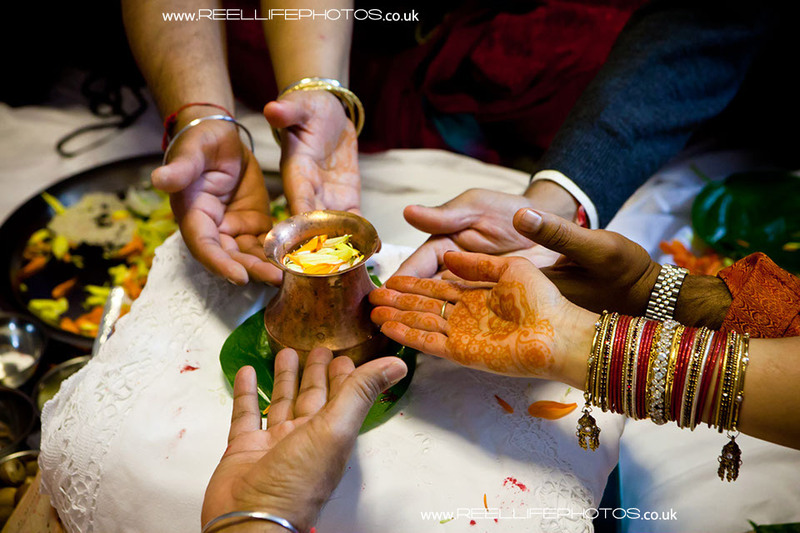 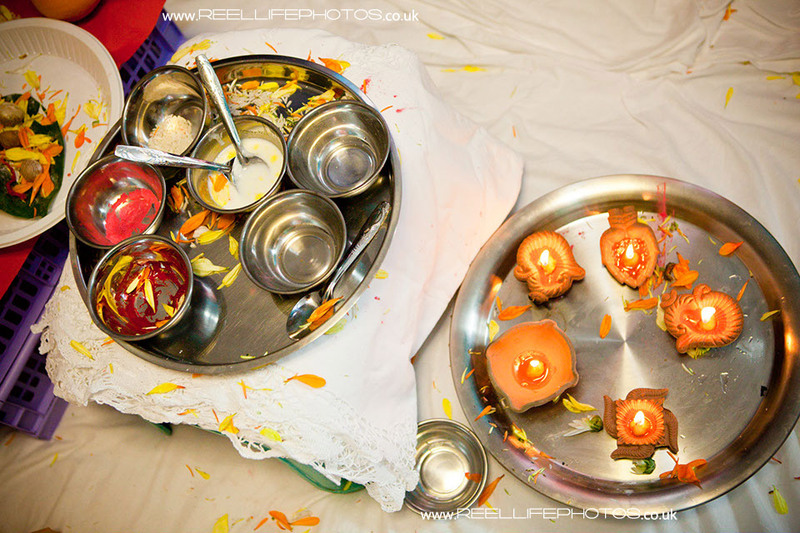 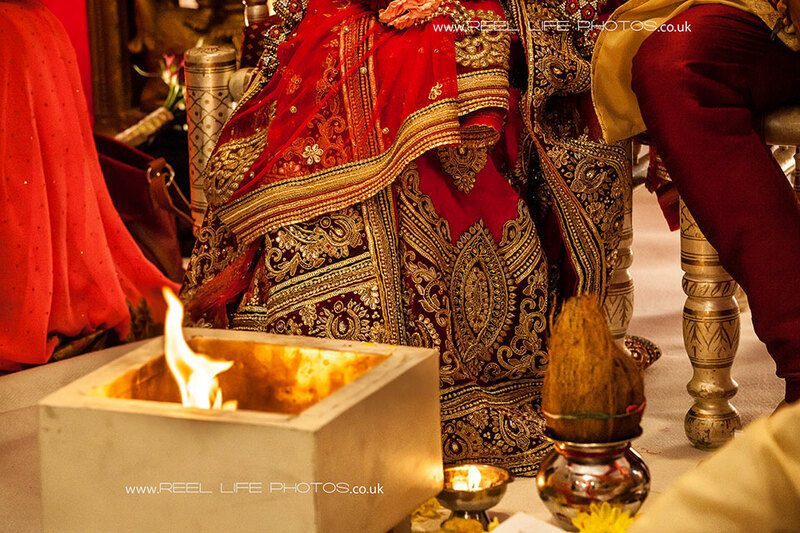 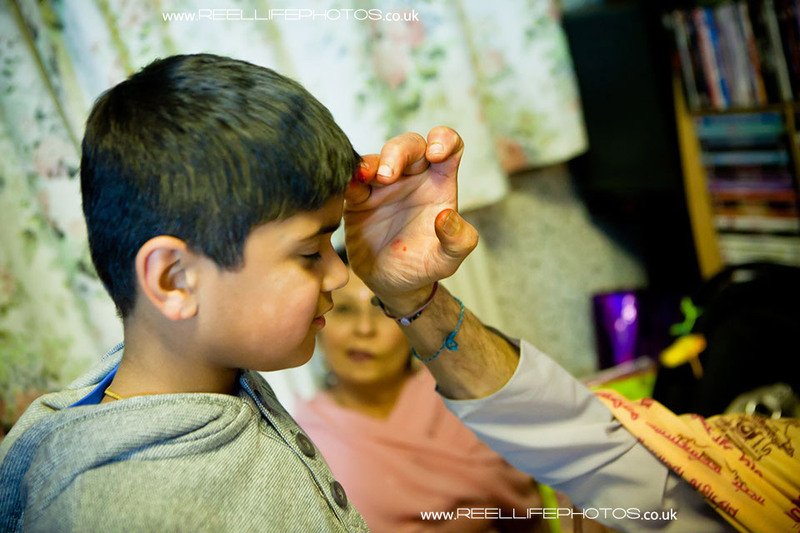 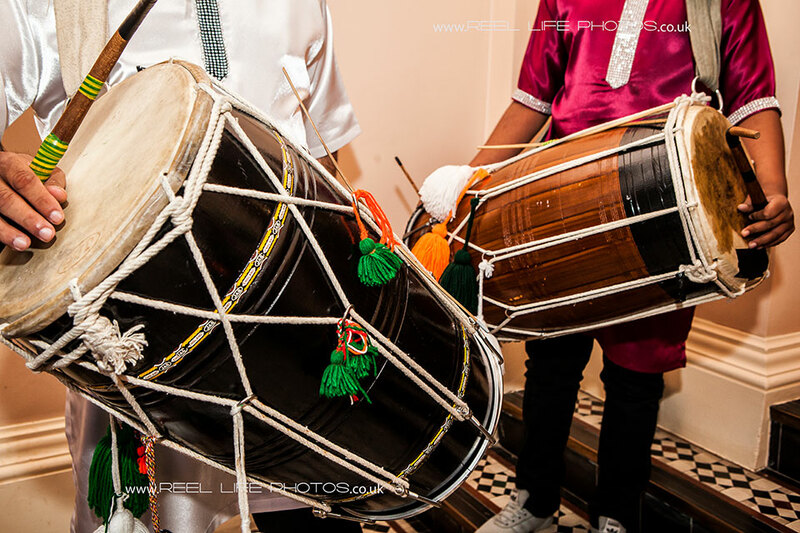 In the meantime here are a few from a beautiful Hindu wedding from last year, that are no longer on the site . 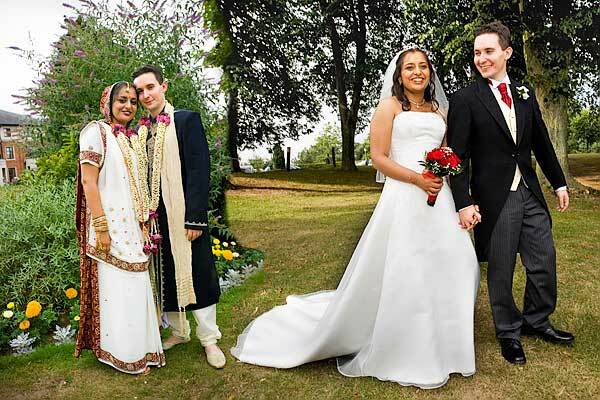 They also had an church of England wedding ceremony, which was hard work to fit all in one day. 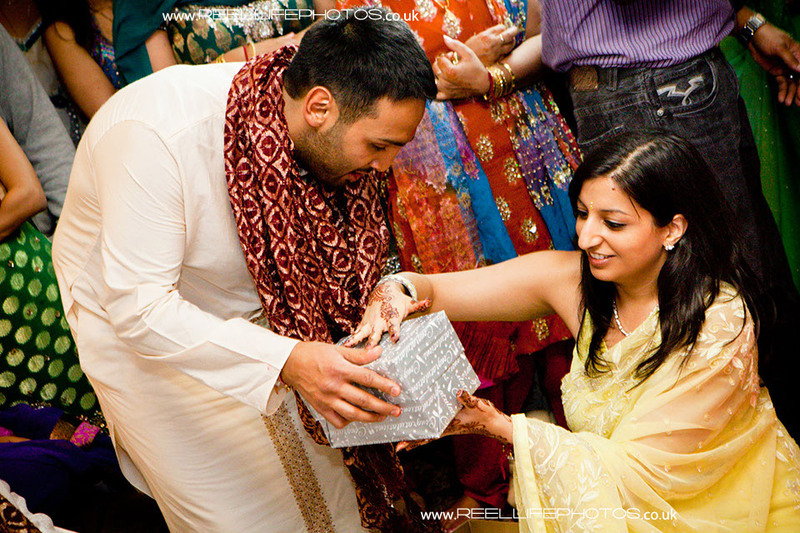 Bhavi was an incredibly good organiser, though! 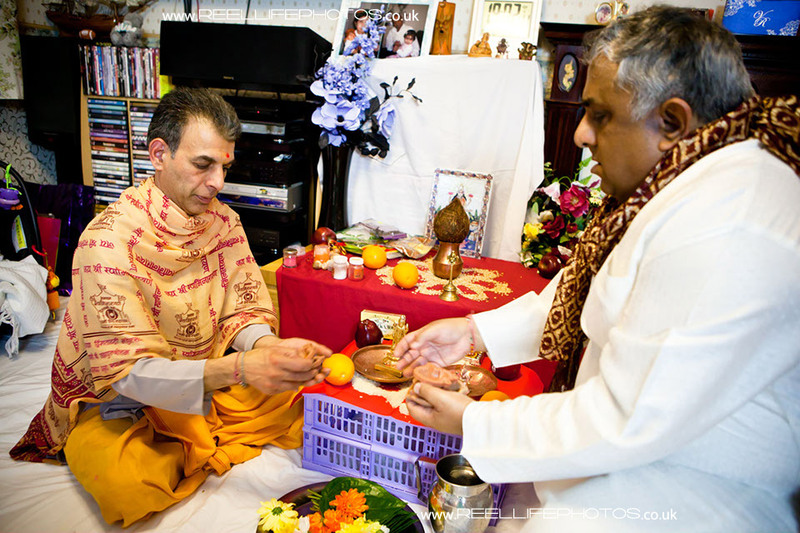 We have another Hindu wedding to video & photograph Spring 2008, in Leicester – as soon as I get back from a wedding in Jacob’s Creek in Australia – and we have a wedding in Ullswater in Cumbria in January, so it looks like being an exciting start to the year.